I arrived at Bosque on November 19 this year, later than I had since 1994 when I got there in early December just ten days after losing Elaine to breast cancer. This was my 14th consecutive late fall visit. The weather this year on average was the warmest by far with morning temperatures on occasion in the high forties. While we did have a few mornings in the 20s, there was not one teen or single digit morning. Such frigid days had been commonplace over the past decade. (Morning temps were in the single digits for an entire week following Thanksgiving Day in 2007.) I stayed in to unpack that first afternoon and at dinner with friends listened to the usual tales of gloom and doom: “There are no birds in the main impoundment.” The next morning there was a huge blast-off from the main impoundment at the peak of pre-dawn color. I guess that the birds had been waiting for me to show up. That afternoon Chris Dodds took me to a great duck spot in Albuquerque. On my second morning of scouting on Friday the 21, I was blessed with south winds and some great flight photography. That evening I met the first IPT group at K-Bobs for the introductory slide program. We were greeted the next morning with one of the most spectacular sunrises I have experienced. 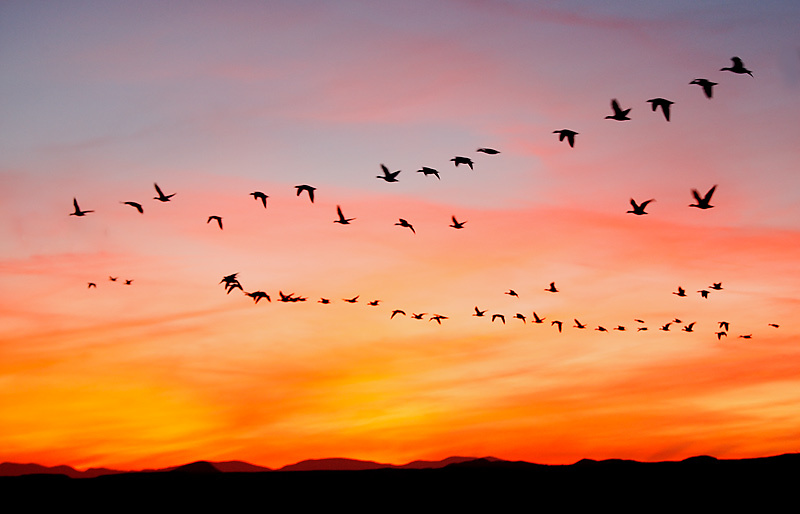 We followed that up with a very lovely sunset filled with birds. On both weekend days we beat the clear skies/northwest wind syndrome in the mornings by photographing the rehab raptors at the Festival of the Cranes. On that Sunday some of us worked the birds in a large tent with flash. On our third morning we had another incredible sunrise. The Wigeon pond in town was excellent this year, and the crane pools were good most mornings and most afternoons. There were geese in the cornfield just before the Phil Norton blind most days during the first IPT and we experienced some great blast offs on our last day together. Mike Cornwell and Bill Lloyd (who was with Chris and me on Bonaventure) were multiple IPT veterans. And it was great to see Tom and Rosalie Kreulen who had been to Iceland with me. Vij and non-photographer wife Wendy were eager to learn as were the three ladies, Patty Knight, Ramona Boone, and Sarah Jessup. Rob Pavey and Jon Saperia (who rode with me) rounded out the crew of happy folks. Robert O’Toole provided leadership help, Nikon guidance (especially to Jon who was most appreciative), and a great Photoshop/APTATS session. All in all, the first group had the best of it photographically. On Thanksgiving morning Robert and I stood in the pouring rain on the Eagle Scout Deck waiting for a blast-off. It was the first actual rain that I had ever experienced at Bosque. 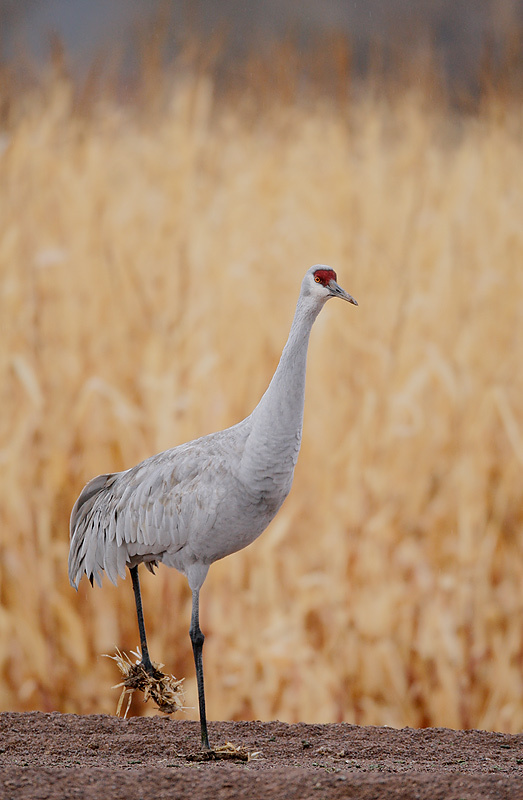 Later that morning we got to photograph some cranes with mud/corn stalk booties. Sixteen of us enjoyed Thanksgiving lunch at the Luna Mansion. As it turns out, the restaurant is closing at the end of this year. I thank Penny Greigo for the great meals that the photography groups enjoyed in Los Lunas over the years. I met the second group on the evening of Friday NOV 28. Scott Bourne of This Week in Photography joined us as co-leader. Multiple IPT veterans in group #2 included Dan O’Leary (with a brand new 800mm f/5.6L IS), Jackie Leader (woman of 1,000 questions <smile>), Brendan Quigley (Broadway head lighting director), Paul Wollam, Mike Goldhammer, and the irrepressible Danny Deen (woof woof!). Dan Streiffert, Kent Downing, Per-gunnar Otsby, and Nicki Gywnn-Jones rounded out an extremely talented group. I knew Nicki from BPN where she is very active on the Eager to Learn Forum. Nicki and Per-gunnar had traveled from the UK to attend the IPT. Kent, who is building a home in New Zealand and moving there with his wife in 2009, was as nice as anyone you will ever meet. Although excellent photographic opportunities were far fewer than they had been with the first group, this group was even more eager to learn. They asked lots and lots of questions, soaked up every bit of knowledge that the three of us passed along, and relished every tip and explanation. We had some cloudy mornings without any color and the blast-offs came earlier and earlier as it got warmer and warmer. 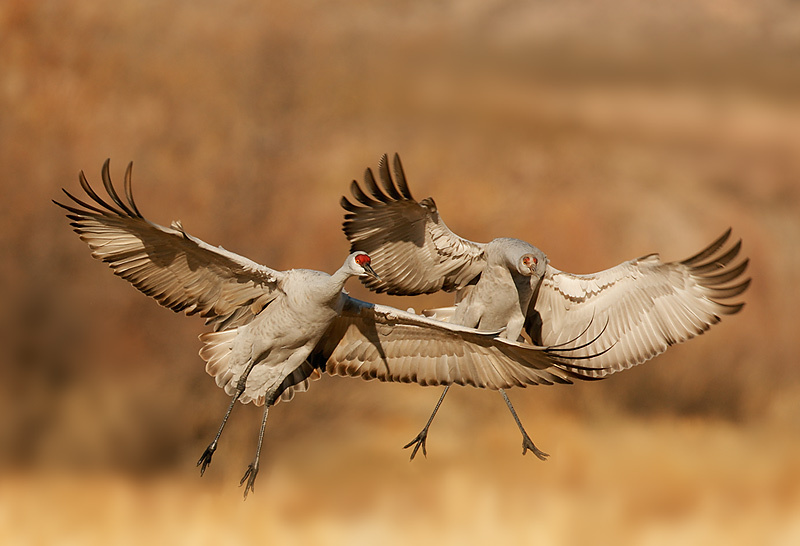 The crane pools were our salvation; we enjoyed some great action there after we left the main impoundment. The wigeon pond continued to be fabulous; we even visited there one afternoon, something that I had never done before. We barely saw a goose near the tour road after the morning blasts as the geese were feeding on corn that had been knocked down in the far northern areas of the refuge. We did however have some good flight chances with cranes coming into the cornfield. Things got better towards the end of the trip. On days 3 and 4 we made a quick move after the blast-offs and were rewarded with some excellent chances with silhouetted geese and cranes at a seldom-visited pond. Group #2 was rewarded for their sweetness and patience with a lovely sunrise on their last day, day 4, DEC 2. Of the 21 folks on the two IPTs, 20 were sweet as sugar and 20 went home happy. Attracting truly nice folks to IPTs is one of the great blessings in my life. Canon 100-400mm IS L zoom lens (handheld at 200mm) with the Canon EOS-1D MIII. ISO 100. Evaluative metering +1/3 stop: 1/25 sec. at f/25. A 77mm warming circular polarizer (at the darkest setting) helped me to warm up the scene and get down to the slow shutter speed that I wanted and needed. Note the clean lower edge (that would not have been possible in 2007 because of the overgrown coyote willows along the banks of the ditches. Many folks stopped by in the field and at K-Bob’s to thank me for organizing the Bosque Open Windows Volunteer Project. While folks (including my groups) enjoyed only limited opportunities at the viewing windows we created, several very important things happened as a result of our efforts. 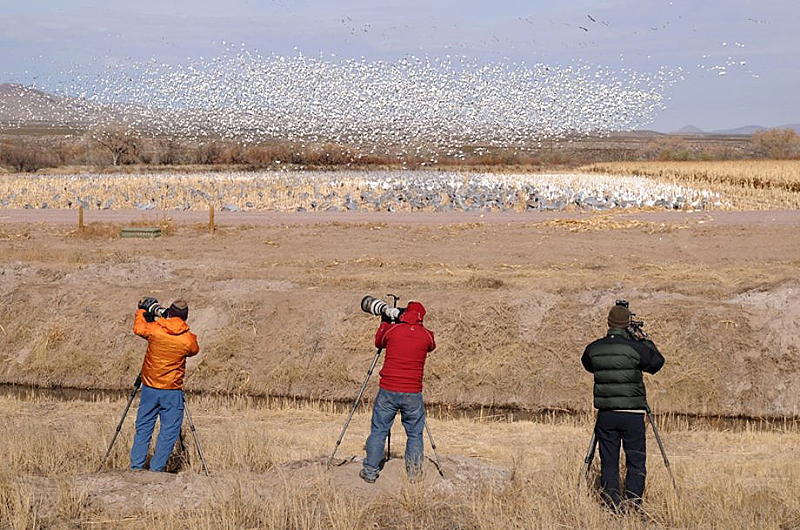 #1: The folks at the refuge realized that photographers—as a group--were willing to put their money, and efforts, on the line. Renewed respect is a good thing. 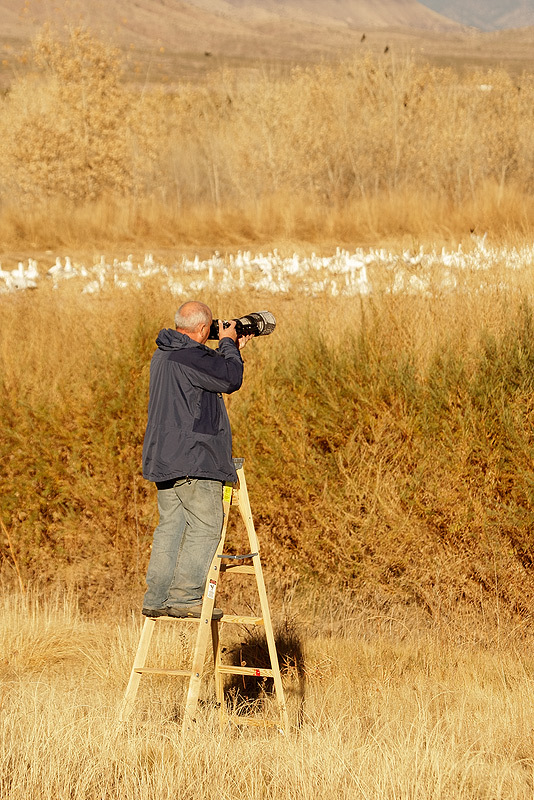 #2: Photographers now have a foot in the door at the refuge. All are anxious for an annual volunteer program. There are lots of great possibilities. #3: Biologist John Vradenburg was good to his word and all of the ditches in important viewing areas were cleared of vegetation via slope mower. Thanks again to John and to Recreation Planner Officer Shawn Gillette for their help with this project. Final note: Though the second group had fewer opportunities than the first, things improved rapidly after that. Many in group 2 stuck around to enjoy the great flight photography that almost always comes along with south winds and overcast skies. I left the refuge at 6:50 am on Thursday DEC 4 to make my 10:10 am flight to Orlando. As I suspected, that morning turned into one of the best flight photography days ever. 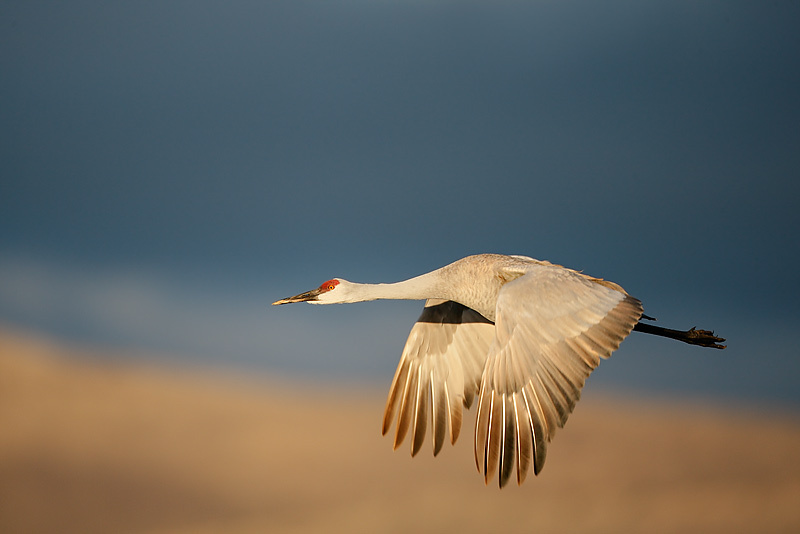 As reported by Robert O’Toole and others, the strong south winds left the cranes and geese were hanging in mid-air as they came into the cornfield to land. Many of the geese landed on the road itself. And on the Saturday morning that followed, there was yet another mega sunrise. You gotta love it! Canon 800mm f/5.6L IS lens with the Canon EOS-1D MIII on the Mongoose M3.5 (http://tinyurl.com/68nxhy) atop the Gitzo 3530 LS CF tripod (http://tinyurl.com/65edtk). ISO 640. Evaluative metering +1/3 stop: 1/800 sec. at f/5.6 in Manual mode. When I saw noted the southerly breeze, dark clouds to the west, and a clear sunrise, I rushed the group to the Ed Krane Pool to take advantage of the situation. As I say often, when at Bosque, pray for anything but blue skies and northwest winds. 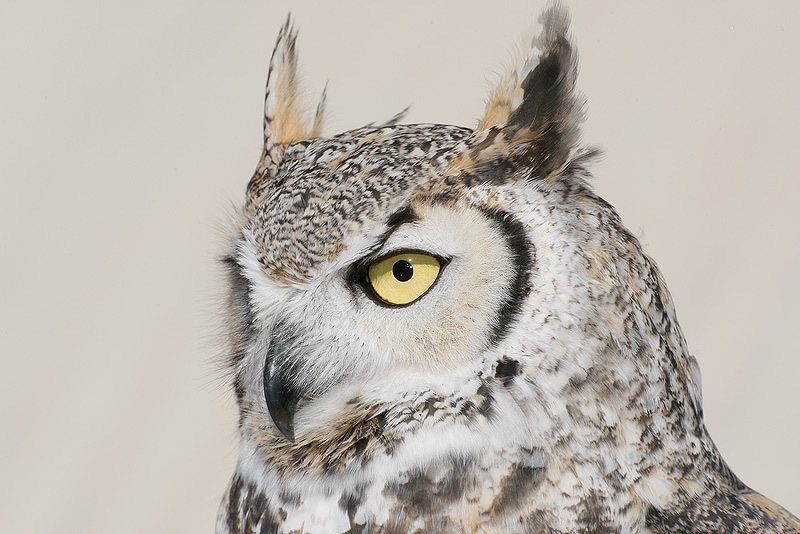 Just as we try to do on IPTs, the Bosque Site Guide attempts to teach you to think like a pro. Artie, just a quick note to say thanks for the marvelous time at the Bosque. As I reflect on this (my third) IPT, I am surprised to find that I probably learned more on this one than either of the previous two. I'm spending more time than usual going over my photos from Bosque, and trying to remember all you taught us. Free of the worries over basic setup and equipment, I have been able to reflect on why some shots don't work and others do not. I have been re-reading the book, and now it's time to re-read ABP II. I know the areas where I need more practice and better technique. I'll return to the Bosque yet this year, and try to reinforce what I have learned. Aside from learning a lot, the trip was a blast due to the great group of people and the "perfect" attitude that you and Robert always deliver. It is truly a great experience. The only bummer was the first ever speeding ticket I managed to accumulate on my way home. Hope that you and yours have a wonderful and relaxing holiday season. I'll look forward to catching up on one of next years IPTs. Paul. DS: Sorry I did not write sooner, but I have been sick with the flu ever since getting back to Seattle. AM: Ah, I am lucky. I have only a cold and an absolutely running nose. DS: I wanted to thank you again for the loan of the Gitzo tripod. DS: That is now the next thing on my list of gear. AM: We have lots of the Gitzo 3530 LS Carbon Fiber tripods in stock. DS: I also wanted to thank you for the opportunity to work with you. DS: I am still amazed at your enthusiasm! For someone who has been doing this same trip for 14 years, you still have more enthusiasm than any of the rest of us. DS: That probably has a lot to do with your success. DS: I also was very impressed with your PS workflow, which made a lot more sense than anything I have read anywhere else. AM: Digital Basics has it all. DS: In all, you have opened our eyes to more possibilities. Thanks for your help. Canon 70-200mm f/4 L IS zoom lens (handheld at 85mm) with the Canon EOS-1D MIII. ISO 800. Evaluative metering +1 1/3 stops: 1/100 sec. at f/4. 45-Point AAFPS in AI Servo Mode. With the prospect of a nice sunset on Day 1 of the first IPT, I opted to set up at my old favorite sunset spot on the Farm Loop Road. As the exposure settings show, this image was made in very low light. Those who stuck it out with me till the bitter end had similar opportunities. The updated Bosque Site Guide was sent this past Wednesday. It contains up-to-date information that will be helpful to those visiting this year, especially to those who will be visiting this month. I updated the pre-dawn strategies, let everyone know which is the best crane pool for evening silhouettes (and why), and added info on the second great duck site. If you have previously purchased the Bosque Site Guide and have not received it, please shoot us your current e-mail address and let us know how you paid so that we can send you the update. Bosque 2009 IPT: “The Complete Bosque Experience.” NOV 21-27, 2009. Slide program on the evening of Friday, NOV 20. 7-FULL DAYS: $3199. Limit: 10/Openings: 9. Co-leaders Scott Bourne and others TBA. Canon 400mm f/4 IS DO lens handheld with a 25mm extension tube and the Canon EOS-1D MIII. ISO 200. Evaluative metering +2/3 stop: 1/300 sec. at f/13. Fill Flash at -1 stop with Better Beamer. I was really ticked of carelessly clipping the ear tuft of this most handsome bird. (See the original immediately below.) After expanding the canvas I easily rebuilt the tip of the tuft using several Quick Masks. I tried some new techniques copying the end of the ear tuft and then shaping it using the Scale and Warp commands described in APTATS. 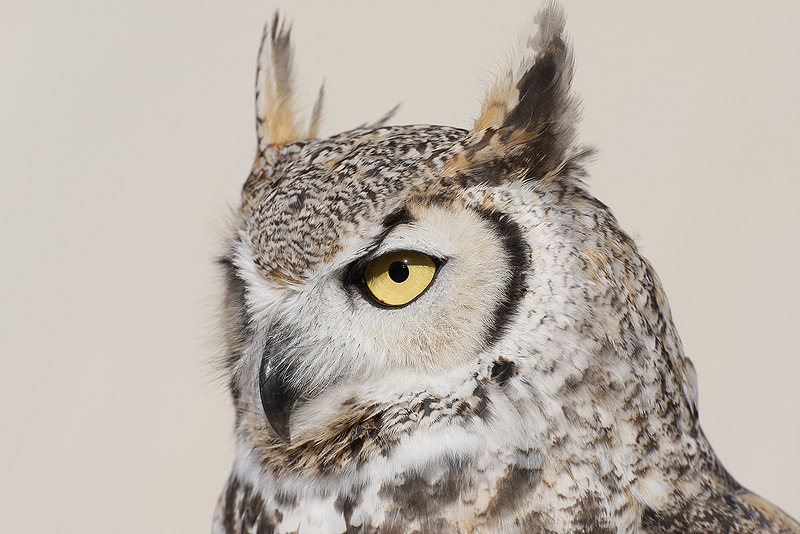 Next year’s Bosque IPT will have similar opportunities with the rehab birds. The image above represents the RAW file for the optimized image above. The image below is a JPEG of the next frame in the sequence. For this one, the flash did not fire because of the fast frame rate of the EOS-1D MII. Note the dark shadow on the eye. I like using lots of fill when working in bright sun to reduce harsh shadows and even out the exposure. For your convenience we now have a computer fax number. You can fax orders to us any time at 1-877-265-6955. Be sure to include the item(s) that you wish to order, the credit card billing and ship-to address (if they are different), you credit card #, expiration date, and the security code, your phone number, and your e-mail address. Canon 800mm f/5.6L IS lens with the 1.4X II TC and the Canon EOS-1D MIII on the Mongoose M3.5 (http://tinyurl.com/68nxhy) atop the Gitzo 3530 LS CF tripod (http://tinyurl.com/65edtk). ISO 400. Evaluative metering +1/3 stop: 1/800 sec. at f/8. 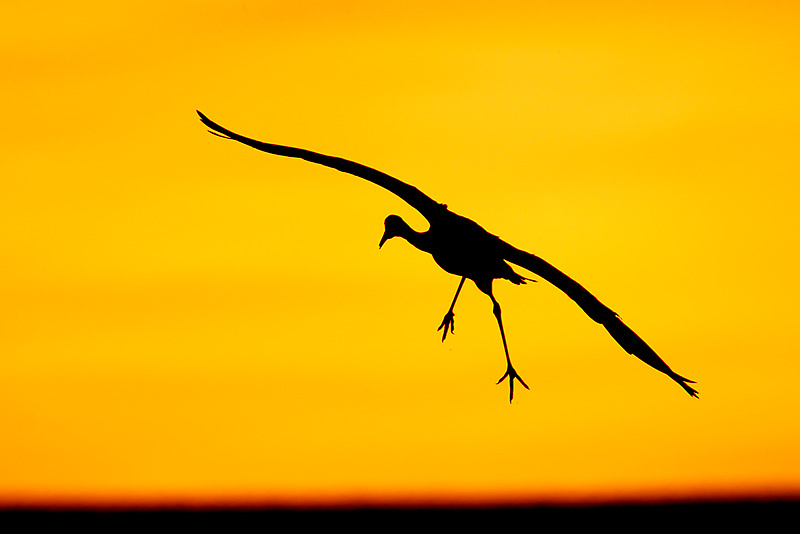 Though this image looks like a crane pool image created at sunset, it was created at a small pond just before sunrise. Bosque is all about understanding the light and the wind direction and speed. For those who love hummingbirds and would like to learn to create their own high speed flash set-up: The Hummingbird Guide – How to Photograph Hummingbirds Using High-Speed Multiple Flash by LINDA ROBBINS with Arthur Morris: http://www.birdsasart.com/hummingbirdguide.htm. Available for $50 plus $3 shipping and handling ($53 total) in the US. Florida residents need to add 7% sales tax: $53.50 plus the $3 shipping and handling ($56.50 total). To Canada the cost is $50 plus $6 shipping ($56 total). For overseas customers the cost is $50 plus $8 shipping and handling ($58 total). A check made out to “Arthur Morris” and sent to us at BIRDS AS ART, PO Box 7245, Indian Lake Estates, FL 33855 is fine. As is a Paypal payment. Or, call us at 863-692-0906 with credit card in hand. 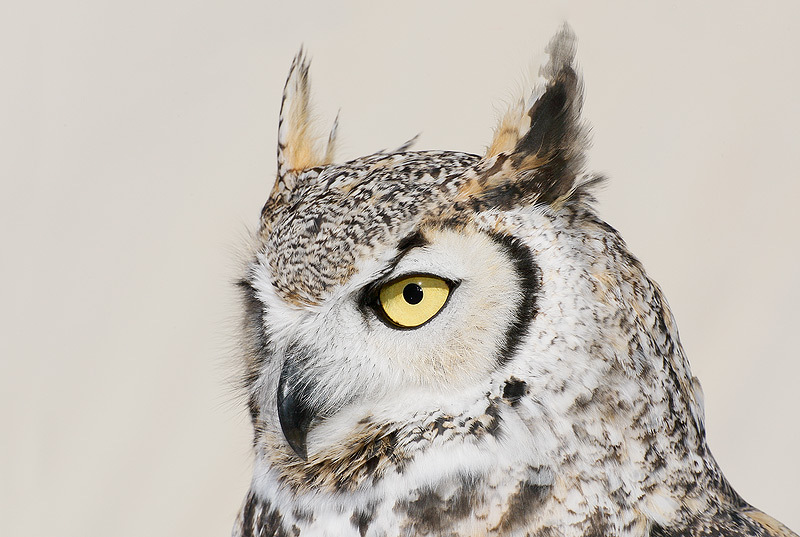 For those who want to bring their Photoshop skills to the next level: Robert O’Toole’s Advanced Photoshop Tips and Techniques PDF on CD only: http://www.birdsasart.com/aptats.htm. You can order your APTATS-1 PDF for $23 incl. shipping and handling in the US. Florida residents need to add 7% sales tax: $24.40 incl. shipping and handling. To Canada the cost is $26 incl. shipping. For overseas customers the cost will be $28 incl. shipping and handling. APTATS-1 is shipped in its final form; it will not be updated. APTATS II is coming soon. Paypal is quite convenient. Be sure to include your ship-to address. You can call us at 863-692-0906 with credit card in hand, or send a check for the correct amount made out to “Arthur Morris” to us as follows: Arthur Morris/BIRDS AS ART, PO Box 7245, 4041 Granada Drive, Indian Lake Estates, FL 33855. For those who like to conceal themselves in the field: the Kwik-Camo Throw-Over Blinds ($20-off Sale/December Only): http://www.birdsasart.com/accs.html#KWIK-CAMO%20THROW-OVER%20BLINDS. Regular price: $127.95. Now on sale for 107.95 including shipping to the USA. Florida residents need to add 7% sales tax to the cost of the item only. For Canada and other overseas locations, please e-mail for shipping charges. For those who enjoy award winning wildlife photography and good writing, Andy Rouse’s "Concepts of Nature; A Wildlife Photographer's Art." You can order a copy of Concepts of Nature today for $37.95 plus $5 shipping to US addresses, $10 to Canada, and $15 overseas. Florida residents need to add 7% sales tax to the cost of the item only. Checks made out to "Arthur Morris," Paypals, or credit card phone orders (863-692-0906) are all A-OK.
Do you know any photographers who are either downloading from their cameras (save us!) or who spend 30 minutes downloading a 4 gb card? Then one of these super-fast Delkin card readers is perfect for them. Delkin CardBus 32 Adapter: for older computers with PCMCIA slots. Delkin Fire Wire 400/800 UDMA Compact Flash Reader: for computers (mostly Macs) with either Fire Wire 400 or Fire-Wire 800 ports. Each of the card readers/adapters above is available from BAA for $59.99 plus $3.00 shipping = $62.99. Florida residents please add 7% sales tax for a total of $67.19. To Canada please add $5 and for overseas orders, the shipping will be $9. Paypal, credit card orders by phone (863-692-0906), and checks made out to “Arthur Morris” are all wonderful. Canon 800mmm f/5.6L IS lens with the EOS-1D MIII. ISO 400. Evaluative metering +1 stop: 1/200 sec. at f/10. Early on at Bosque large groups of geese were spending the afternoons in the southwest corner or the main impoundment near the Paybooth. On a day when they seemed particularly placid I spread the tripod wide and got down in the really soft mud to create some eye-level images. My sneakers and even my underwear wound up wet and muddy.... The additional problem was that the birds were tightly packed together. When these two swam a bit away from the group, I found that I could not fit them both into a single frame. After carefully checking the bubble level in the camera's hot shoe I made a few images of the front bird and a few images of the back bird and later stitched them together in Photoshop. JL: I read your BAA bulletins regularly. I very much appreciate the exposure information you include - especially the fact that you explain the exposure compensation you dialed in. It's even better when you explain why you dialed in that comp. But there's one piece of the puzzle that is missing. I'm a Canon 40D owner. I don't know how different it is on the 1D series. AM: On average, you need to be 2/3 to a stop darker with the 40D and the 50D than with the MIII series bodies. JL: With cameras like the 40D, evaluative metering keys the exposure very much to the focus point in use, which can shift the exposure by a significant amount. AM: I believe that this is generally not true and that the only time that the choice of AF sensor affects the meter reading is if you have linked spot-metering to either the center or the active AF point via Custom Function. I think that what you are trying to say is that the framing affects the exposure reading when there are large areas of light and/or dark tonalities in an image. Snow Geese in main impoundment, predawn color with crescent moon, Bosque Del Apache NWR, San Antonio, NM Image copyright 2008: Arthur Morris/BIRDS AS ART Canon 24-105mm IS L lens (at 32mm) with the Canon EOS-1D MIII (mounted on the Giotto’s tiny ballhead via a Wimberley P-5 camera body plate). ISO 400. Evaluative metering +2/3stop: 1.6 seconds at f/4. The meter reading would be very different depending upon where in the frame your chosen focus point was when you took your meter reading. Was it on the water? The sky? AM: I was using back focus (the old custom function 4) as I almost always do when making long exposures with a short lens on the tripod, the exposure was real time as the image was framed. (Real time exposure is the exposure at the moment the shutter button is depressed. JL: Do you normally work with just the center focus point when shooting landscapes? JL: I have absolutely no idea how the Nikon matrix metering system differs from the Canon in this regard. Perhaps you could explain this in a future bulletin. Canon 800mm f/5.6L IS lens with the Canon EOS-1D MIII on the Mongoose M3.5 (http://tinyurl.com/68nxhy) atop the Gitzo 3530 LS CF tripod (http://tinyurl.com/65edtk). ISO 400. Evaluative metering +1 1/3 stop off the gray sky: 1/1000 sec. at f/8 in Manual mode. When the wind shifted momentarily to the south east on group 2’s third morning, we had some good chances with the cranes landing. When the refuge staff cleared the area by the creek of weeds to make room for photographers they left several foot high piles of dirt that made perfect vantage points. By getting as high as possible, we were able to make our images before the birds disappeared behind the road at our eye level. Canon 800mm f/5.6L IS lens with the Canon EOS-1D MIII on the Mongoose M3.5 atop the Gitzo 3530 LS CF tripod. ISO 800. Evaluative metering +1 stop: 1/400 sec. at f/5.6. This image was made on very wet and soggy Thanksgiving morning when there was just not very much going on. By keeping your eyes open and thinking out of the box it is possible to made soup from mud. All workshops are 3 days, orientation and slide show the night before. Price per person is $999, which covers all instruction. Lodging, transportation and meals are not covered. Maximum 10 participants per workshop. We will have six “in the field” sessions (weather permitting) and three classroom sessions. In the unlikely event of bad weather, classroom sessions will replace the field sessions. We will focus on developing your vision and personal style. Creativity will be encouraged. There will be Lightroom and CS3 tutorials as well as artistic use of PS filters and blending modes. The use of some popular PS plug-ins will also be covered. There will be a critique session to evaluate your work on the last classroom session. Come join us in the land of magic and take fresh ideas, motivation and great images with you. SW FLA POST X-MAS IPT: DEC 27-29 or 30, 2009 Slide program on the evening of DEC 26. 4-DAY: $1799. (3-DAY OPTION: $1349). Limit: 10/Openings: 5. Co-leaders: Robert O’Toole and Alfred & Fabiola Forns. This IPT is shaping up to be a practically private affair; we may very well wind up with more leaders than participants. If you can fit this IPT into your holiday schedule, do consider joining us. 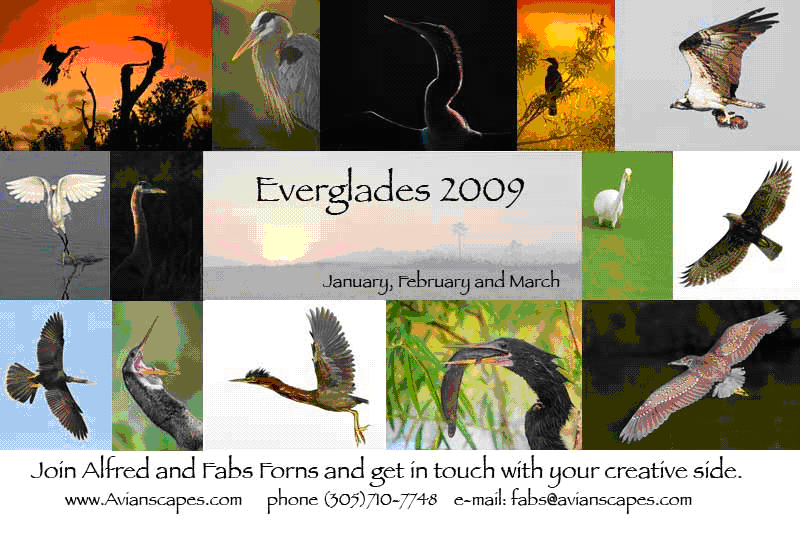 There is some truly great photography available in Florida while winter is setting in in most of the country... Call now for late registration discount! Canon 800mm f/5.6L IS lens with the Canon EOS-1D MIII on the Mongoose M3.5 atop the Gitzo 3530 LS CF tripod. ISO 800. Evaluative metering +1 1/3 stop off the sky: 1/1000 sec. at f/7.1. 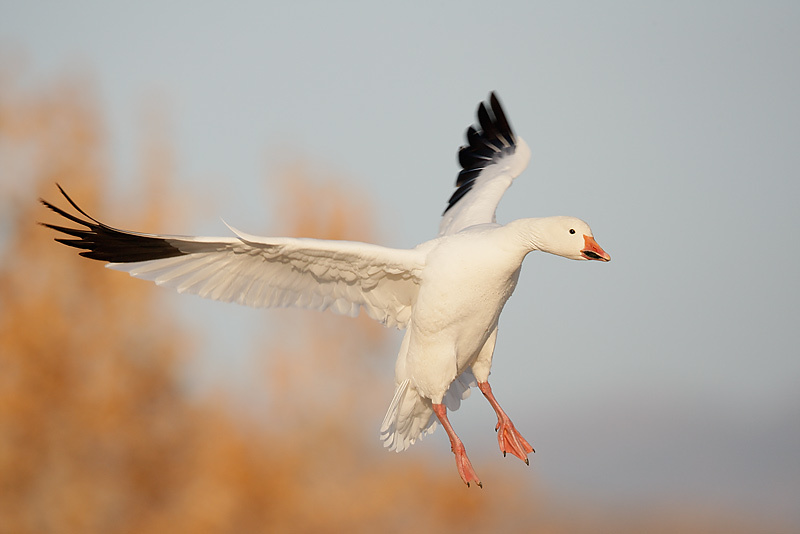 The two best Snow Goose flight photography mornings were the 21st, the day that I met the first group (Chris Dodds termed it “epic”) and the day that I headed for the airport. 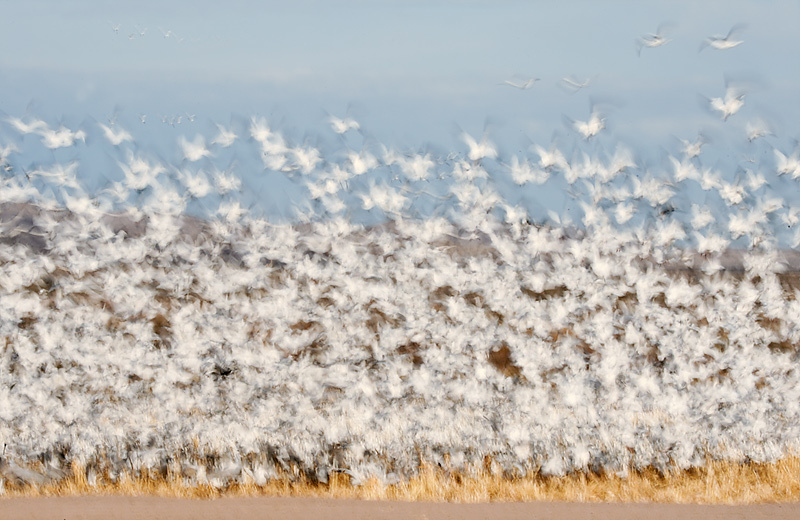 South winds are rare at Bosque. SW FLA POST X-MAS IPT: DEC 27-29 or 30, 2009. Slide program on the evening of DEC 26. 4-DAY: $1799 (3-DAY OPTION: $1349) Limit: 10/Openings: 4. Co-leaders: Robert O’Toole and Alfred & Fabiola Forns . This IPT is shaping up to be a practically private affair. If you can fit it in your holiday schedule, do consider joining us. There is some truly great photography available in Florida while winter is setting in in most of the country... Call for late registration discount! Bear Boat #2: Sept 4-10, 2009. Openings: 3. (It is advised that you be in Anchorage on the afternoon of the September 2nd to be assured of not missing the boat!). This one is the bears catching salmon trip. In addition, Glaucous-winged and Mew Gulls eating roe are a certainty. Dark phase Northern Fulmars and Black-legged Kittiwakes (including the gorgeous immatures), Harbor Seals, and Stellar ’s Sea Lions are likely. Did I mention bears catching salmon? And more bears catching salmon?